Entranced by Mexican architecture, Bertram Goodhue designed many structures in a Colonial style, including at Montecito's Country Club. In the summer of 1916, officials of the Santa Barbara Country Club (the name changed to Montecito Country Club in 1922) engaged the services of architect Bertram Grosvenor Goodhue to design the club’s fourth and final clubhouse. Sitting high on a hill just west of Hot Springs Road, the clubhouse engendered some controversy while its high cost almost spelled the end of the club. Goodhue was born in 1869 to a Connecticut family that could trace its origins back to the Mayflower. Bertram’s mother was a talented artist, and she and her eldest son shared a studio in the family home. As early as age nine, Goodhue expressed his ambition to be an architect. Forgoing college, at 15 he became an apprentice at a prestigious New York firm where he honed his skills copying senior architects’ drawings, vital in the days before copy machines. For this he was paid all of $5 a month, which was actually more than apprentices often received. In 1891, Goodhue enjoyed his first breakthrough when he won a competition for a cathedral design in Dallas. The following year he traveled through Mexico and became entranced by that country’s architecture. The effects of these travels can be seen in much of his later work. Goodhue’s first contact with this area occurred when J. Waldron Gillespie hired him to design his Montecito estate, El Fureidis, in 1901. In 1902, the two journeyed around the world together to gather inspiration for the project. Completed in 1906, the estate, a wonderful mix of Spanish, Italian, and Persian influences, was one of the most magnificent achievements in this affluent community where magnificence was almost commonplace. This was an especially creative time for Goodhue. In 1902, the firm at which he was a partner received the commission to redesign the Military Academy at West Point. This led Goodhue to relocate to New York, where he eventually opened his own firm in 1914. It was during this period that he developed a reputation as an architect of churches, designing places of worship for New York, Pittsburgh, and Havana. A new phase of his career opened in 1911 when he was chosen as architect for the Panama-California Exposition, to take place in San Diego in 1915. His designs were a triumph, and his work gets much credit for popularizing Spanish Colonial architecture in California. His California Building, with its tiled dome, is still the crown jewel of the city’s Balboa Park today. Goodhue continued to be active here. He designed the Montecito home and grounds of Henry Dater Jr., completed in 1918. This estate later became Val Verde, the home of Wright Ludington. 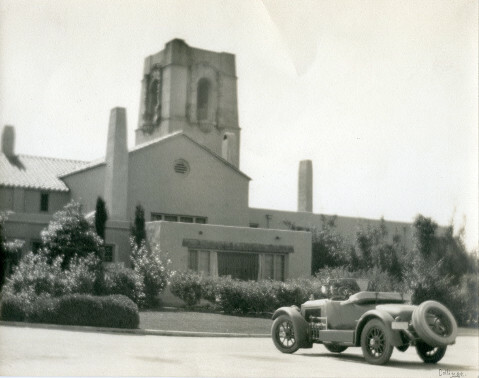 His design for the Montecito Country Club, with its three-story tower, was very much reminiscent of his church designs. The crushing debt resulting from construction cost overruns led to the closure of the club in 1921, before its reorganization under its present name and 1922 reopening. Other notable Goodhue works include the National Academy of Sciences in Washington, D.C., the Los Angeles Central Library, the Nebraska State Capitol, and the entire company town of Tyrone, New Mexico. Just as he was preparing to journey to Washington for the dedication of the Academy of Sciences building, he was felled by a heart attack in April 1924. He was five days short of his 55th birthday.